Yu Aida's Gunslinger Girl was a spectacular and disturbing anime that tackled the moral issues of condemning tween girls to a shortened life due to cybernetic implants and brainwashing. In addition to its story, the animation and attention to detail made Gunslinger Girl stand out among the rest of the "girls with guns" genre. Fans of the original Gunslinger Girl will quickly note that the second season Il Teatrino has a change in art direction that is as subtle as a tank backing into an apartment building. 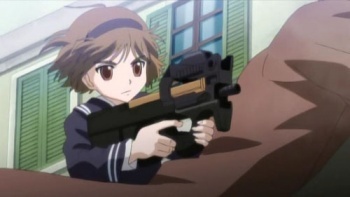 While Gunslinger Girl had a grand budget for its 13 episodes, the episodes of Gunslinger Girl: Il Teatrino had a significantly smaller budget and it shows. The heavy use of panning, zooming, and shaky cam techniques on static background images are frequently used for several establishing shots and action sequences. The new Japanese voice talent in Il Teatrino is not as refined as the original cast as they awkwardly squeeze into their roles, though the English dub still uses the same cast. Getting used to the simpler and more vacant look of the characters takes time. The new character designs combined with the pastel color scheme throughout the series makes the series simply look - for lack of a better word - cartoony. Getting past the low budget animation and new character designs, Il Teatrino does feature a more centralized story than its predecessor. It continues the vignettes detailing the lives of children working for Section 2 of the Italian Social Welfare Agency, a clandestine Italian government agency intended for counter terrorism. Enhanced with cybernetic technology and trained in firearms, the little girls along with their handlers engage in missions to thwart the Five Republics Faction (FRF) terrorist organization and its attempt to blow up a bridge under construction. Several minor characters from the first season return to show the coincidental connections between both the FRF and the Agency. Additionally, a pair of terrorists who survived the first season return as major characters. Tying most of the episodes of Il Teatrino together is the rivalry between Triela from the Agency and the talented FRF hitman Pinocchio. Il Teatrino features several episodes told through the FRF point of view so that the organization develops into something beyond target practice for the girls. These episodes attempt to shine a more sympathetic light on the FRF members by showing them with their families, being wronged by the government, or seeing the futility of the FRF and retiring. Il Teatrino gives the Agency a new recruit for the team and returns a previously injured girl to active duty. Otherwise the girls are still receiving conditioning to ensure loyalty as they kill terrorists to appease their handlers. These same elements of Gunslinger Girl are brushed upon in Il Teatrino but it does its best to not be redundant. Pinnochio himself is a wonderful addition to the series. His character serves as a parallel to the girls of the Agency, which makes him a perfect foil to Triela. One of the best parts of Il Teatrino is seeing how similar they both are as they bond with their respective companions and new acquaintances while preparing to their final duel. It is a pity that the Pinocchio arc has a huge gap midway through Il Teatrino, which breaks the flow in storytelling. Even with a peek into the FRF and the Pinocchio arc providing a central story, Il Teatrino lacks the tact to make the best of them throughout the series. While it was great to introduce the FRF and compare them to the Agency as they each show off their ambiguous moral issues, Il Teatrino only skirts those issues and does not execute the mood or emotion as its predecessor. Outside of Triela versus Pinocchio, the gun battles have a mediocre execution due to the smaller animation budget. Additionally, the girls' new look complete with giant puppy dog eyes overshadows their original subtle characteristics. Instead of portraying Rico's enthusiastic gratitude at her new life and Henrietta's possessive nature regarding her handler, the pair feel more like the sadistic twins from The Shining as they gleefully make their kills. It makes it hard to take the show seriously. The finale leaves room for a possible third season. If approved, hopefully the producers will spend more time and money to polish the directing and animation. Bottom Line: Even with the potential for a riveting sequel, the cheap animation and clumsy storytelling make Gunslinger Girl: Il Teatrino a poor series compared to Gunslinger Girl. Recommendation: Pass on Il Teatrino and stick to the original Gunslinger Girl. Tom Tonthat was expecting either Rico or Henrietta to say to their handlers, "Come play with us. Forever and ever." Gunslinger Girl: Il Teatrino is available as a two DVD set spanning 13 episodes and suspiciously lacks the two OAV episodes that follow its conclusion.